The new 14-inch Razer Blade is now officially and is launched at a price of USD $2,199. The new Razer Blade 2014 Edition comes with vigorous specifications. The company has made many changes to make the device snappy and more approachable. The laptop is dedicated to Games mainly and comes with stunning graphics capabilities. It has Quad core Intel Core i7 4702-HQ ( 4th Generation ) processor cloaked at 2.2GHz and can be cloaked at 3.2 GHz ( Turbo). It has intel HM87 Chipset accomplished with Nvidia GeForce GTX 870M 3GB graphics. It comes with a new 14 inch IGZO 3200 x 1800 pixels Ultra HD resolution Multitouch with LED Backlight Display. Talking about the Storage it has 128GB / 256GB / 512GB SATA M2 options. The new Blade is packed with Latest Intel Wireless AC 7260HMW, DUAL BAND 802.11 a/ b/ g/ n/ ac and Bluetooth 4.0. To make the Laptop Alive there is 70Wh battery, which is same that we seen in old version. It runs on Latest Windows 8.1 64-Bit operating system. The new 14inch Blade Measures about 13.6 x 9.3 x 0. 70 inches and weighs 2.03 Kg. The Dimension and Weight of the laptop is more that its predecessor. It packs with a 2.0-megapixel primary WEB CAM at the Front. It offers 3 x USB 3.0 slots , HDMI 1.4a port, standard audio input out put jacks and Backlit anti ghosting Keyboard connectivity . 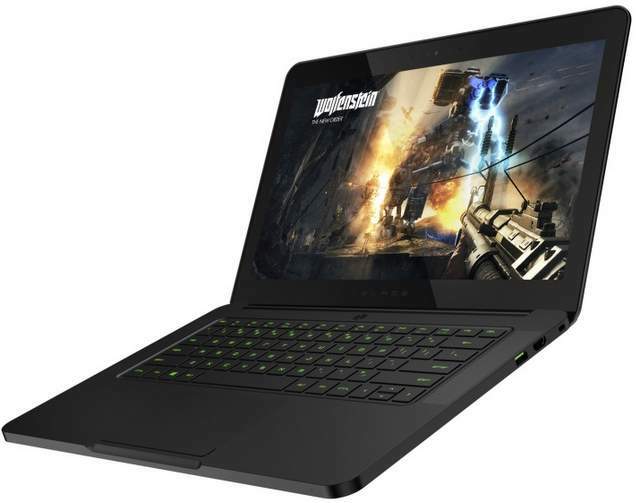 The Razer Blade is priced at $ 2200 for 128GB and would be first headed to Russia, Taiwan and North America thereafter.